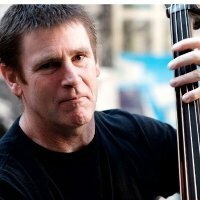 Paul Gabrielson is a jazz bassist who is currently living and working in New York City. He works with such luminaries as drummers Jeff Watts, Jeff Herschfield, Jon Wikan and Mark Ferber Pianists Benny Green, Bob Florence, Bill Mays, Geoff Keezer and Larry Fuller Guitarists Ron Affif, Paul Bollenbach, Corey Christianson, Randy Johnston, Don Mock and great horn players such as Ingrid Jensen, Duane Eubanks, Terrell Stafford, Jon Gordon and has worked with jazz artists such as the Mingus Big Band, Diane Shure and Ernestine Anderson, Jay Clayton and Mark Murphy Paul is a native of Seattle Washington and has worked with many of the jazz musicians in that area. “I owe a great debt to the musicians I worked with in the Northwest who provided me with the opportunity to learn this great art” Musicians such as Jay Thomas, Marc Seales, John Bishop, Dawn Clement, Marc Taylor, Jim Knapp, and Randy Porter Paul earned his Bachelors in music at Central Washington University and a Masters of Arts in Music at City College in NYC studying with jazz bassist John Patitucci. Paul is now teaching undergraduate studies at City College. He has also spent time studying with jazz greats Ray Brown, Cecil McBee and John Clayton. Paul is also fluent in many styles of music working with the popular folk group The Kingston Trio, folk songwriter Tom Paxton, and rock icons Steve Miller, The Tubes and Maria Muldaur.